Create you own custom installation, panel by panel, mix and match in any order. Large SUV's and complex bumpers are more. Full bumper, 18' hood and fender tips, headlights and mirrors. Full bumper, full hood, full front fenders, headlights, and mirrors. Full Front plus lower rockers, A-pillars, roof line, rear wheel edges. Full and complete PPF coverage from head to toe, top to bottom. Ottmann Detailing has joined forces with Invisibra to provide the best detail services for our clients. 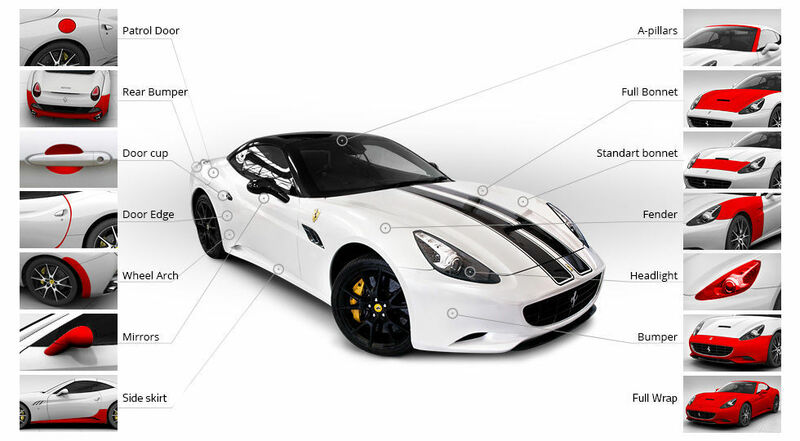 Whether it be wash and wax, paint correction, full Interirors or ceramic coatings, we provide concourse level detailing. For those who want that extra protection on panels without PPF film or on your wheels and rims. These coatings last 3-5 years and are an invaluable commodity along side your PPF installation. Ottmann Detailing started in 2007 and is the expert when it comes to paint correction. Whether your vehicle needs a one-step process or concourse level finish, we can take care of it for you. Keep the sun out of your eyes and the inside temps of your vehicle cooler. We provide an on-site window tint installer by appointment only. Are pesky door dings ruining the look of your favorite ride? We will get them removed for you with our PDR services. By appointment only. Ottmann Detailing will lift your car and provide wheels-off concourse level detailing and undercarriage cleaning.